During last year's Summer of Code I had the honor of mentoring Nanduni Indeewaree Nimalsiri. She worked on Inqlude, the comprehensive archive of third party Qt libraries, improving the tooling to create a better structured web site with additional features such as categorization by topic. She did an excellent job with it and all of her code ended up on the master branch. But we hadn't yet made the switch to change the default layout of the web site to fully take advantage of all her work. As part of SUSE's 15th Hack Week, which is taking place this week, I took some time to change that, put up some finishing touches, and switch the Inqlude web site to the new layout. So here we are. I proudly present the new improved home page of Inqlude. All libraries have additional meta data now to group them by a number of curated topics. 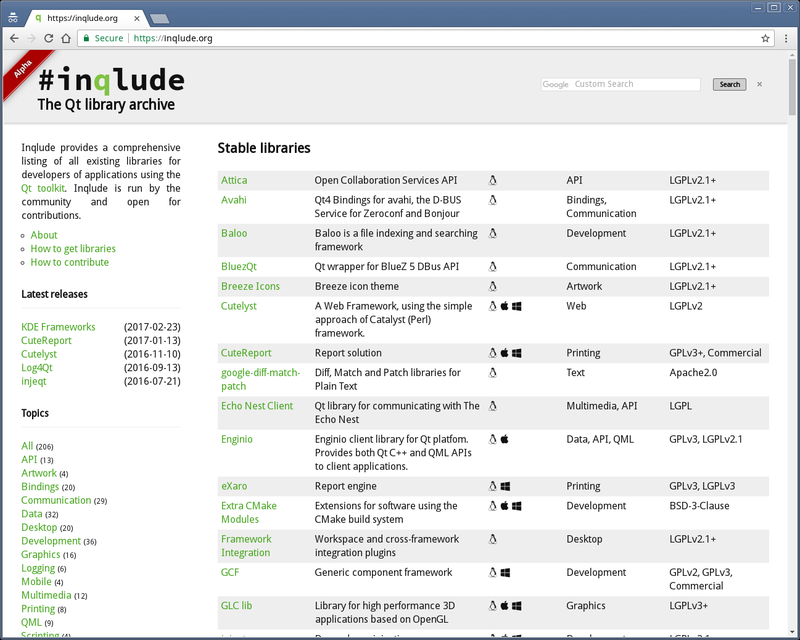 You can see the topics in the navigation bar on the left and use them to navigate Inqlude by categories. The listing shows more information on first view, such as the supported platforms, to make it easier to find libraries according to your criteria without having to navigate between different pages. The presentation in general is cleaner now, and some usability testing has shown that the page works better now than before. In addition to the visible changes, Nanduni has also done quite a bit of improvements under the hood, including better automated testing. I'm proud of what we have achieved there. It always has been a privilege for me to act as mentor as part of Google's Summer of Code or other programs. This is one of the most rewarding parts of working in free software communities, to see how new people learn and grow, especially if they decide to stay involved after the program has ended and become valuable members of the community for the long term. Being able to help with that I feel is one of the most satisfying investments of your time in the community. Congratulations to Nanduni Indeewaree Nimalsiri, and categorized stuff is really needed on topics as libraries. But you really need help of some web designers. Help of designers is always welcome. If there are any volunteers, please feel free to contact me. P.S. : using Chrome latest version. Hm, this works for me.